Who doesn’t love a cute custom map?! Okay, so like being paper nerds, the staff at Persnickety are total nerds for maps- especially if there is adorable artwork! Maps don’t only help us make sense of our surroundings; they also help the reader to know why certain locations are important. This is why Persnickety is currently crushing on these adorable custom maps! An absolutely gorgeous pencil drawing Melissa of Persnickety designed for a Cape Cod wedding. Do you have a lot of out-of-town guests traveling for your big day? 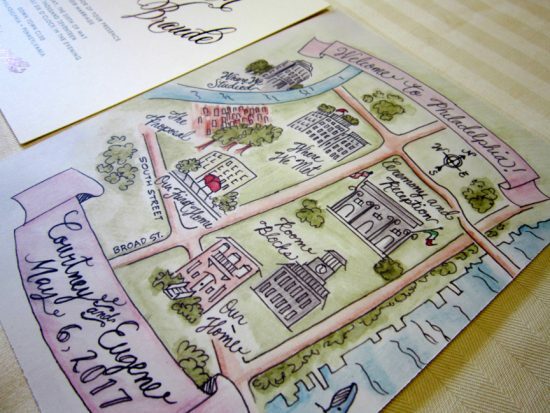 Help them celebrate more and wander less with a customized map of the city your wedding is being held in. 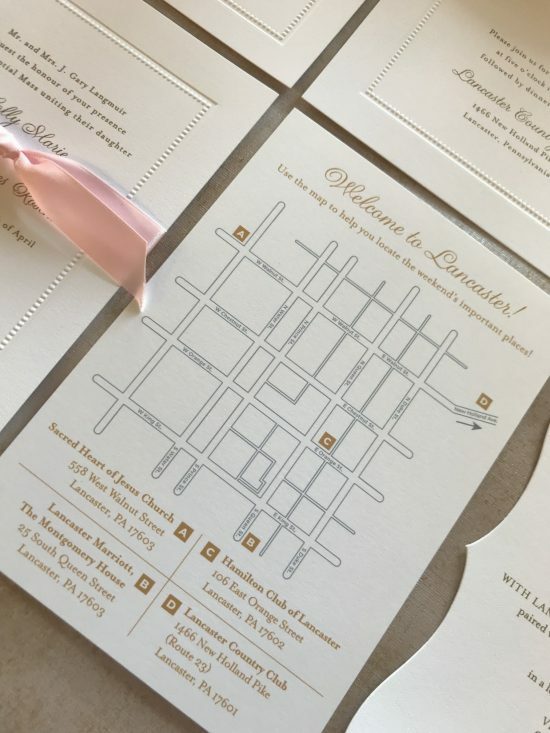 A custom map from Persnickety is the perfect insert card to include in your wedding invitation suite or in the welcome bags for the hotel. 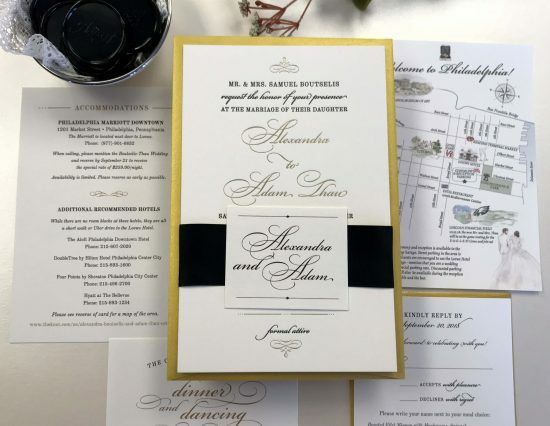 Alexandra and Adam’s stunning custom letterpress and gold foil invitation by Persnickety. A a custom map makes the whole suite come together. Not only does it give your guests the knowledge of where your ceremony and reception are, they also mark some fabulous places nearby for them to visit in the off hours. 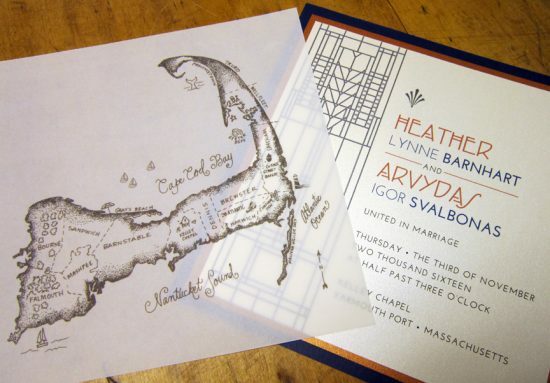 Custom maps are an absolute must for destination weddings. You can also include itinerary information on your custom map so guests know the when, where, why, and how of your wedding weekend. This adorable watercolor of Philadelphia makes Philly look SO good. 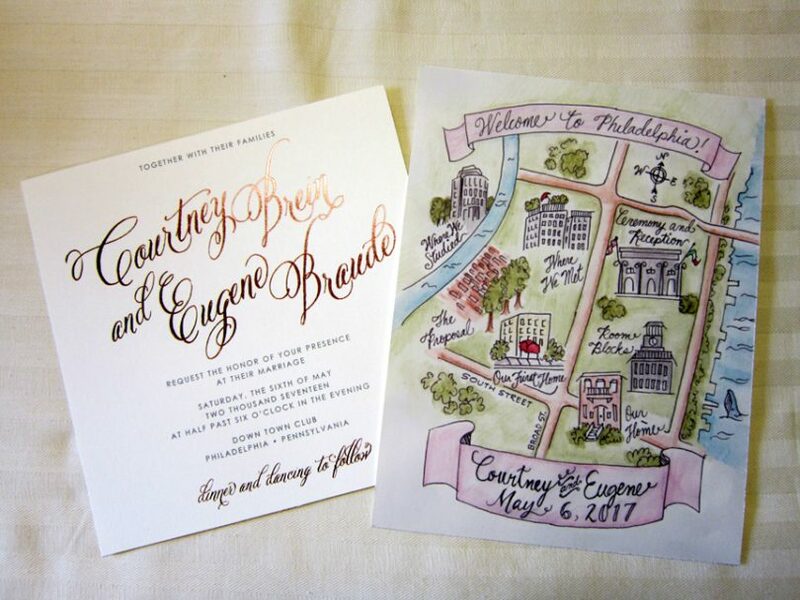 A custom map also makes for the perfect keepsake. These sweet little designs help you remember all of the incredible places where you said “I do,” all while displaying your personality and style as a couple. Persnickety designs both hand drawn, illustrated maps, as well as digital ones. We absolutely adore the look of the watercolor designs! It’s so cute to mark all of the fun places that you love as a couple. A cute digital map of Lancaster City! Already have a custom map idea you’re dreaming up? Schedule your appointment with our graphic designer today. Let’s talk all things maps here.